One of the best ways to reduce cooling costs while living in a hot, sunny climate is by having radiant barriers installed in the attic. According to the U.S. Department of Energy, having a radiant barrier can reduce cooling costs by 5 to 10 percent, which really adds up over time. Unlike most insulation that’s used in the attic, it doesn’t work by impeding conductive or convective heat flow. Instead, it reduces radiant heat gain in the attic, helping to keep your entire home cooler and helping your air conditioner work more efficiently. To understand how radiant barriers work, you need to understand how heat travels. There are three ways in which heat travels from warm areas to cooler ones, which includes conduction, convection and radiation. With convection, a liquid or gas, including air, heats up and becomes less dense. As a result, the gas or liquid rises. When it cools down, it descends. With conduction, heat travels from a hotter spot within a material to a cooler one within the same material. With radiation, heat travels in a straight line away from a surface and heats any solid material that is capable of absorbing it. As the sun beats down on the roof of a home, its radiant energy make the surface of the roof hot. Through conduction, the underlying roof materials get hot too. The heat is then radiated onto cooler surfaces in the attic, where it can then be transferred into the home itself. This heat counteracts the cooling that’s being accomplished by the air conditioning system, forcing it to work harder. Also, this can make it much more difficult to achieve optimal indoor comfort on especially hot days. 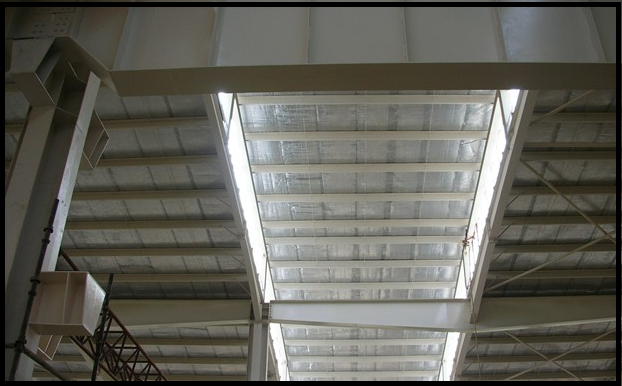 Radiant barriers use highly reflective materials — most typically aluminum — to deflect radiation from the sun. In turn, the radiant heat can’t warm up the attic, and the entire process described above is stopped in its tracks. Ideally, radiant barriers should be installed in newly built homes. However, they can be added to existing homes. They just need to be perpendicular to the source of radiant energy and must face open air space. Also, steps should be taken to minimize the amount of dust that accumulates on them, as it can negatively impact their effectiveness. To learn more, contact USI online to get a free quote. USI believes that excellence in every step of the process ensures timely completion and quality service, time after time. How do blower door tests and energy audits work for commercial buildings? Which Types of Insulation Help Reduce Noise? ← What are the Benefits of Insulation for Your Basement? Let our local experts assist with your home improvement project. Learn how we’ve become a national leader in building services. The window installers were very professional and did an excellent job installing and insulating the new windows. All material was neatly cleaned up and hauled away immediately. I was very happy with Champion. They were quick to come by and give me an estimate for adding insulation to my entire attic and they were competitive in terms of their pricing. They were friendly, on time, and neat in their work. The installer was very polite, very punctual, and very professional. I will be using them again.